Maine residents may renew a snowmobile registration online. New registrations must be done through a registration agent or the MDIFW main office in Augusta. Nonresidents may register or renew a snowmobile registration online. This online service allows you to register your snowmobile with the State of Maine. Following your transaction, you will receive a confirmation page to print for immediate use. Your official registration and stickers will arrive at the shipping address specified within thirty days. Registrations may also be obtained from licensing agents or by mail. Free Snowmobile Weekend in Maine is February 1-3, 2019. 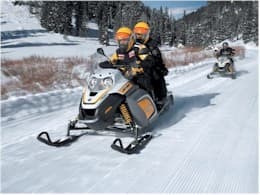 During this weekend, a nonresident (from another state or province) may operate a snowmobile in Maine (no reciprocity necessary) so long as he/she has a valid registration from another state or province. Agents may charge a fee of $1 for renewals and $2 for new registrations. *Fee includes $1.00 agent fee. Proof of payment of sales tax required for new registrations (Maine residents only). The following is a list of agencies certified by the Department to rent snowmobiles for recreational purposes. If you are interested in renting a snowmobile while in Maine, please contact one of the agencies listed below. If you would like to become a rental agency, please contact the Department at (207) 287-5230. See you on the trail! Below you will find a list of registration agents in Maine who register nonresident snowmobiles. There are also a few agents listed at the end of the list from New Hampshire and Vermont.